What Is The Best Hair Restoration Method? In the last decade, hair transplants became a popular choice by many people suffering from baldness or density issues. Naturally, surgeons in this area tried different techniques to achieve the best results planting the hair. Therefore, different doctors started using different techniques for the same purpose. The answer to the question “What is the best hair restoration method?” is not a single sentence, but the best method is an ideal combination of factors and conditions for each unique case. In Follicular Unit Extraction method, the hair transplant surgeon extracts each hair follicle one by one from a donor area. A “Graft” consists of 2-3 hair follicles. This procedure aims to harvest 2000-4000 grafts, 5000-10000 hair follicles. Because grafts are extracted individually in the surgery, it dramatically increases the success rate of the hair implants and the chances of having a more natural look. The quality of extraction affects the outcome significantly because each graft becomes a new hair in the area where there is no more hair. Naturally, more damaged grafts mean less successful rooting. Therefore, extraction is the essential aspect of the FUE operation. Any extraction technique that doesn’t involve a scalpel may be called FUE. Instead of using the scalpel, use of any size punch will qualify. It may be sharp, dull, manual or motorized. All the different names given to the procedure come from the use of the punch, they all serve the same purpose, and each surgeon may utilize depending on their style. There can’t be a better type than other alone; their effectiveness depends on the surgeon and the patient’s scalp characteristics. Especially in hairline fix surgeries where precision is very crucial, surgeons prefer to use the FUE method. The reason is, they can work in more detail by planting the grafts gradually to create a more natural look. In general, FUE gives more versatility to the surgeon, and that is the main reason for the shift in the industry from the FUT method to FUE. FUT was the first method of hair transplants. With the rapid developments in the technology, more doctors started to learn and perform the FUT method. In the beginning, it was a great invention. People desperately tried different ways for ages to slow down the hair loss and when they finally found out there was a new and permanent solution, it was a miracle. However, in time as more people had the transplants, more complaints there were about the linear scar the procedure left. It took a very long time for the wound to heal and the patients were not content with the look. FUT method had solved a significant problem and was the first step of a permanent solution for hair loss. But it wasn’t enough; it had to be improved. These events led to the invention of the FUE method. By a special punch, surgeons were able to harvest individual hair follicles and move them to a recipient area. Because each follicle was extracted one by one, the surgeon was free to choose the donor follicles. As a result, this enabled them to get the hair from many different areas on the scalp thus leaving less or no scar in a brief amount of time after the procedure was complete. Today, more doctors are changing their methods because when the patient is less concerned about the cost or, they are willing to afford it, they don’t want the linear scar on the scalp. Therefore FUE type hair transplant surgeries become more popular. Follicular Unit Transplantation procedure has a different surgery path than FUE. Unlike FUE procedure, in FUT the extraction of the donor hair follicles happen at the same time by striping the scalp linearly to get the grafts resulting in a linear scar on the scalp. In each graft, 1-4 hair follicles exist, and they stay together after the extraction. Then the surgeon prepares these for the next stage of the procedure. Since each hair follicle remains in the graft together, when after planted, they are planted together. Naturally, this gives a denser look as groups of hair follicles together create the density. However, when the recipient area doesn’t have a symmetrical shape, the surgeon can’t distribute the donor area precisely to the recipient area. Thus, FUT is not a very good option for hairline fixing surgeries or when the hair loss is uneven. This is where we step in. You might find a lot of information favouring one method over the other. From our point of view, it depends entirely on the patient’s scalp characteristics and financial range. An average graft of FUT costs almost half of what an FUE graft costs in most of the clinics. Because the FUT method requires transferring hair follicles with less effort, it requires less skill or dedication compared to FUE method. 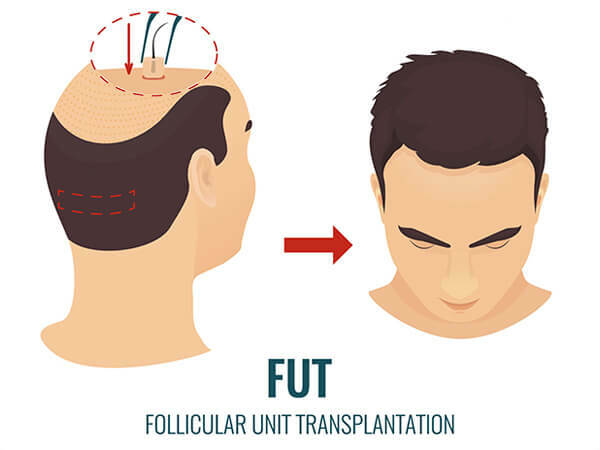 Moreover, since FUT leaves a scar in most of the cases and people don’t want it, it drops the demand and eventually the price of FUT type of hair transplants. Besides, more doctors are switching to FUE each year which proves FUE is becoming more popular with the surgeons in the market. For those people willing to get their natural look back or fix their hairlines, FUE seems to be a more effective option. However, it is very reasonable that some patients have a less budget or willingness to invest in this operation. In some cases, the hair characteristics of the patient are suitable for both methods. If the type of the procedure doesn’t affect the results then naturally going with the cheaper option is the wisest option. Also, in some cases, patients specifically aim for a denser look in the symmetrical area. In these cases, FUT is advisable over FUE. The news in the industry suggests that the popularity is shifting towards the FUE type hair transplants. ISHRS doctors performed more FUE operations in the last years. In the future, if the FUE prices drop, more patients will prefer to choose FUE procedures. Therefore, the momentum seems to be on the FUE method’s side for now. Lately, we have seen some doctors combining two techniques together and form a new method. These doctors claim they use both techniques to create the best results. 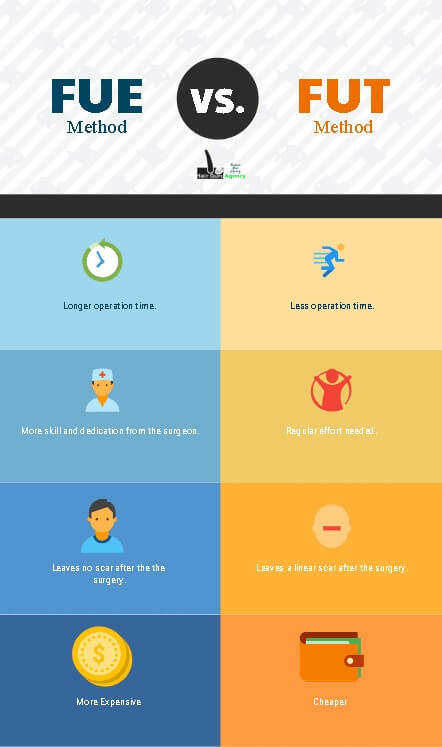 Theoretically, a surgery can be conducted with two methods used together. The idea is reducing the size of the linear scar while having FUE to make details better. So, the cost of the surgery decreases while there is no linear scar left. The problem here is, when the hair follicles are harvested in two different ways, their look is different. In the short term, that wouldn’t be a problem but in the long term, your hair can’t look natural. Yet, for people who can’t afford an FUE or don’t want to spend too much on the procedure can give it a try. However, we believe results would be very limited. The full potential of a hair transplant won’t be present in this kind of hair transplant operations because FUT technique reduces the quality of work. But the results would be better than a solo FUT procedure as FUE can increase the result’s quality. It might be a good idea to do extensive research on the clinic and only go with the procedure after you believe results are promising. Because if you have a problem with the results, there are not many places doing the same technique to fix it. Sadly, in the last decade, a new trend started in the hair transplant industry. By changing the procedure equipment, or merely changing the punch name, some marketing folks try marketing tricks. Although the method is still FUE or FUT, to make it more appealing, they produce and promote alleged techniques in the industry. For a new method to be a new method, it must be significantly different than the existing methods. 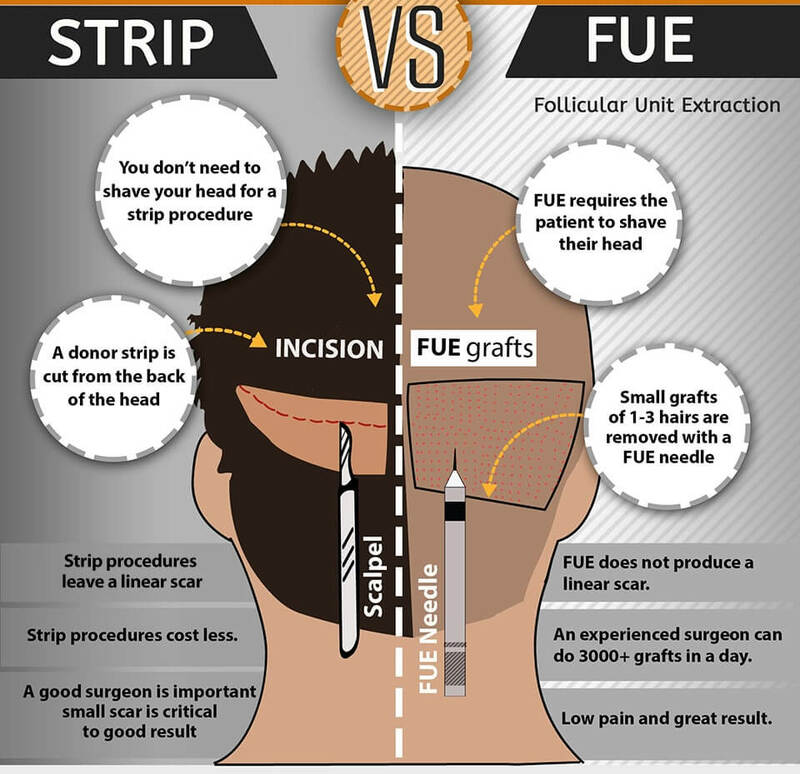 For instance, FUE is different than FUT because of the difference in the graft extraction. Since extraction is an essential aspect of the hair transplants, FUE was accepted a new way of restoring hair. Thus, unless the new method has a significant difference, it is only a different name to the same product. The most common trick is naming the procedure by the name of the punch selected in operation. We saw a lot of names derived from punch types and tagged explicitly with “bio” and “neo.” After brief research, individuals can conclude that the procedure is the same as the FUE or FUT, but only the name is different. We have recently conducted research on robotic hair transplants. This type of surgery is different than all others because instead of a surgeon directly working on your scalp, the surgeon uses a robotic machine. It is close to a fully automated system. 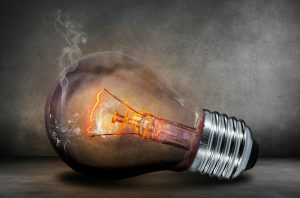 However, even on the websites and advertisements, we see a clear explanation of the technique as FUE. Unfortunately, it brings us back to our earlier analysis when we discussed the Neografts. Although there is machinery involvement, it is still an FUE surgery. Also, when we look at the price, it is the same price as a regular FUE surgery. Therefore, we concluded that even though results seem promising for the future, for now, there is proof if this technique is better than FUE or should be considered as a strong alternative. DHI is one of the new ways to approach the FUE method. It is the same procedure, the only difference is instead of shaving the head for the surgery, the surgeon chooses to let the hair stay as it is and proceed with the operation. There is not a structural difference between FUE and DHI as DHI is actually FUE. With that being said, a lot of patients wants to keep their hair. This is very natural. The only possible problem with DHI is, since your scarred area is next to the long hair, and hair absorbs microbes easily, you take a risk of getting the area infected. Also, depending on the surgeon’s skills, it might reduce the quality of the surgery or it might not have an impact at all. Many doctors can conduct DHI style FUE surgeries, but they choose to shave the head if they can for hygiene reasons. However, if you want to go with a DHI that is totally fine, but finding the right surgeon would be essential. The reason why people try to market these words is, it is our instinct that when we hear words like bio and neo, we perceive them as upgrades of the current ways. It is perfectly reasonable to think this way. Anyone who studies consumer behaviour knows this tactic. When a product and service reach the saturation, that is when marketers use this technique. Knowing that a new approach needs implementing, marketers change the names or features and reposition their merchandise. Naturally, this attracts the consumers who know most of the products out there because it is new. Adding the inner desire to find a better solution, some patients fall for it. Unfortunately, until a new way is found and proven scientifically, FUE and FUT methods are the only permanent solutions for hair loss. Therefore, we do not recommend any of them. The bottom line is, there is no such thing as the best hair restoration method. Like there is no best colour or food, it depends entirely on the person. For every type of product and service, individual needs vary. It is necessary to process information separately for each unique case. After deciding to have a hair transplant, the first thing you will witness is people trying different methods to sell their services. This is the case for any other industry out there. The best way to protect yourself from it is doing extensive research, getting different opinions from different doctors and being patient. And don’t lose hope, because, in the end, it’s worth it.